Welcome aboard the Independence. Designed by Dough Peterson, this 52-foot sail sport legend one of the largest sailing yacht in Koh Samui. Her interior is made up of solid Burmese teak wood, Italian Alcantara fabric cushions and a galley with a black granite top. She is a luxury experience second to none with her 3 spacious cabins complete with double beds, and a fully equipped salon for couples, families, and groups of friends. Independence is rigged to go around the world so you can rest comfortably knowing that she will safely bring her guests around Koh Samui and its stunning surrounding islands such as the Ang Thong National Marine Park, Koh Phagnan and Koh Tao. 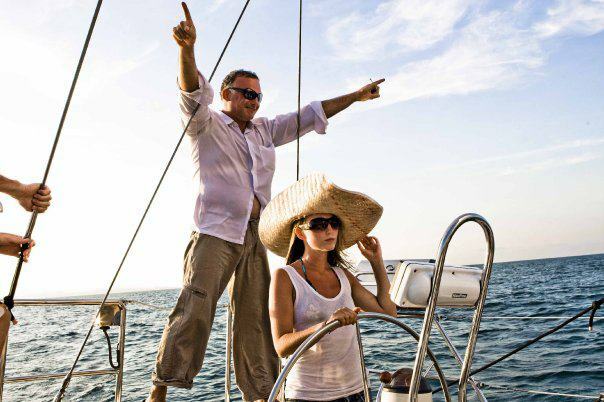 Whether you choose a sunset cruise, a full day trip, or an overnight charter, you are assured to have the most extraordinary experience you fancy; this is your indulgent opportunity to relax and unwind, and to be lavished aboard the luxurious Independence out on the open seas complete with 5 star treatment and authentic Italian cuisine. Luca guarantees your needs are met while you relax in the cool breeze and enjoy the beautiful scenery of the Koh Samui archipelago and beyond. Luca has extensive knowledge of the region and excellent sailing skills to ensure your safety and peace of mind. On our trips we combine fun and speed with luxury and spacious comfort. We have English and Italian speaking crew.